In years past, I could pick a theme of the show based on how the show reflected the economy. In down years booths got smaller, and fewer manufactures show up. As the economy slowly got a bit better, booth sizes went up. This year, it was mixed bag, as some manufactures expanded, while others shrank. Rather, I think this year’s theme was “Retro throwback.” There seemed to few truly new products, with many of the most talked about products being re-introductions of previous products. 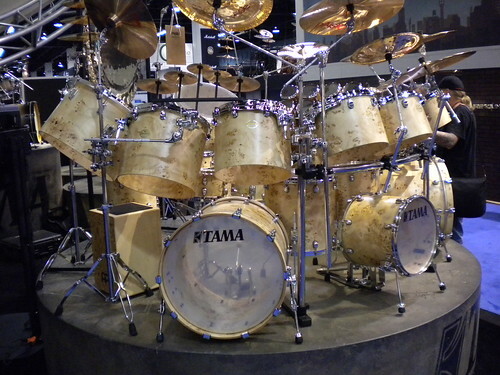 Tama gave everyone a shock with their Keith Moon inspired set up featuring Retro throwback single headed concert toms. As far as products, they were all in on the “retro throw back theme” with the re-introduction of the Prestige series, one of their better selling mid-line kits from the mid-late 80’s. My favorite “new” product by far was the “Retro throwback” Clubdate line. I have been saying to Ludwig, and all the other manufactures, for years now that they are missing a big market segment of guys who have big expensive kits at home, and want something simple, in a wrap, that sounds good, they they can throw in the car for bar gigs. Finally, someone listened to me! The Clubdates have the look and feel of a vintage Ludwig kits, but with modern engineering, and best of all, they do not cost the arm and leg like actual vintage kits do. I want one, badly! 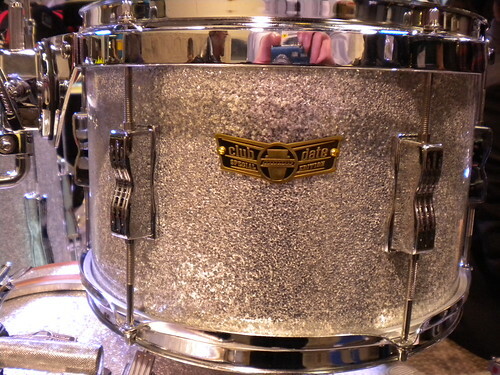 Also was debuting at Ludwig was their Atlas line of hardware, which was a mix of new and retro products. The rubber foot design on their flat based stands is one of those simple ideas that makes you wonder why no one ever thought of it before. It allows for two heights, so you can crisscross the legs of flat based stands. They are a perfect compliment to the Clubdate kits. The new pro snare stand is simply the best designed snare stand I have come across. The new pedals and pro stands are nice, but as someone else said to me, they seem a little late to the party; they do not seem than different than hardware that Gibraltar and DW, among others, have been offering for years. One of the most talked about products on the internet before the NAMM show was that Yamaha was re-introducing their hex rack system. This time they are stronger, lighter, and fully compatible with the old racks. And in keeping with the “”Retro throwback” theme, Yamaha re-introduced several throwback colors to the their timeless Recording Custom line. 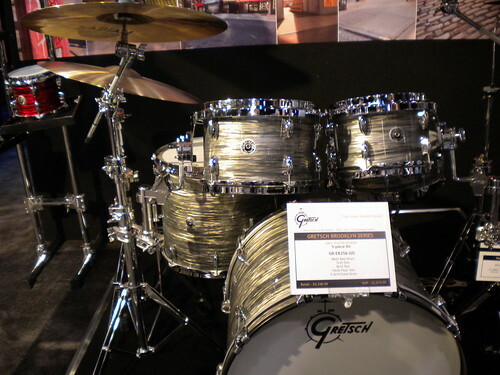 Gretch’s booth was centered with a large completely mirror chrome kit, a real throw back to the 1980’s. 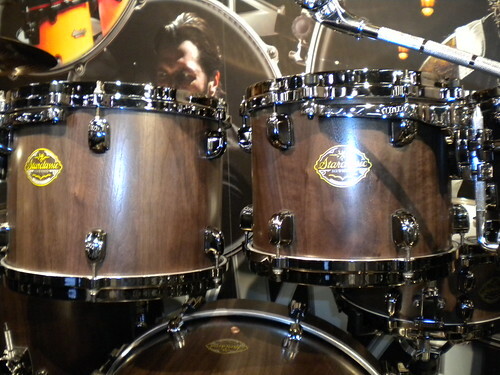 Of note was their “new” Brooklyn line of drums, which are a “Retro throwback” to their 1950’s round badge line. 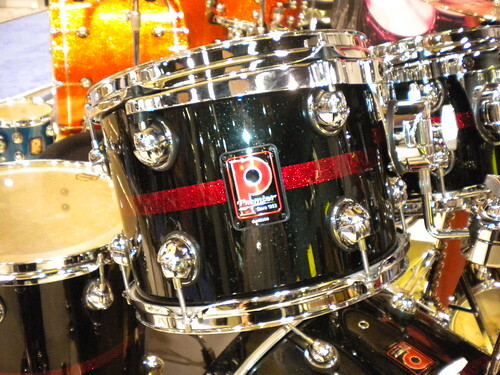 After several years of not being at NAMM, Premier drums was back at the show in full force. Good news for those us who are fans of Premier. DW was absent from the main floor. They instead had their booth up on the distant 3rd floor, with their public showcase only a small crammed room. For a company that has excelled at product placement and name brand recognition, it was an odd move to remove themselves from the main public eye like this. 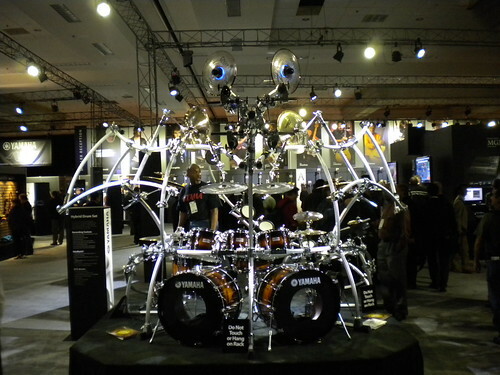 Crush drums was only all to happy to use DW’s absence to have a bigger booth with an impressive range of drums kits. 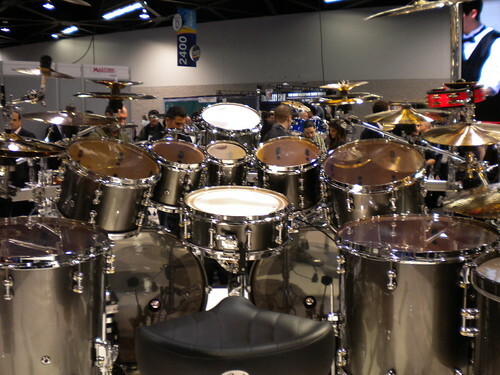 DrumCraft also took part of the extra floor space to make a case for a bigger US market presence. Last year, Natal has a huge booth with no one manning it. This year they scaled back into a much more effective booth. Still they were there to show that despite being the newest kid on the block, they can do everything the big names can do. Rocket continues to expand the concept of what can be done with graphics on a drum kit, seem to be getting stronger and better. 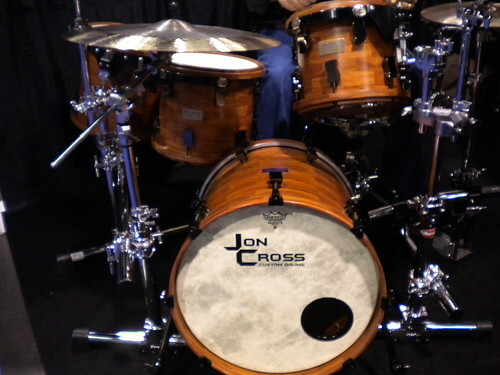 Craviatto, Pork Pie, C&C Custom Drums all continue to showcase great drums to die for. 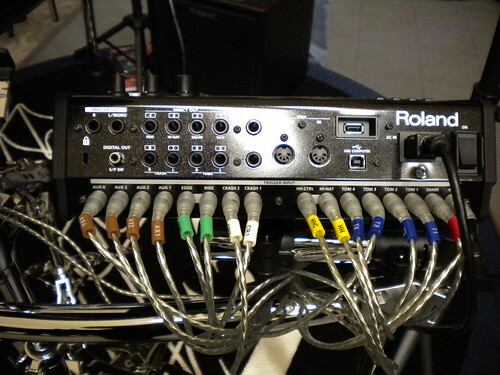 After what has seem like forever, Roland finally upgraded the TD-20 module with the new TD-30. Of note this new module features a digital out, two USB ports, and now the pad inputs are separated from the audio outs. Clearly, this module is designed for the modern recording studio much more than the TD-20 was. Much like last year, the number of cymbal brands keeps increasing, and all claiming to be real Turkish cymbals, or the best sounding cymbals. I think they all make fantastic products, but it becomes increasingly difficult to distinguish one brand from the next. 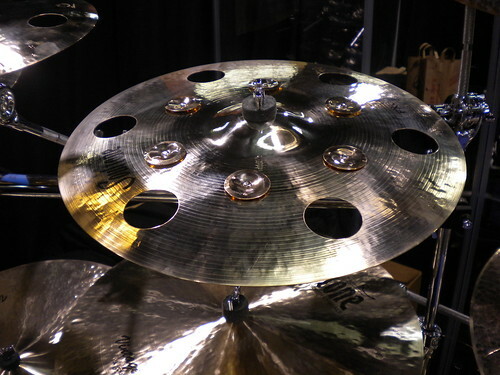 Zildjian kept with the “Retro throwback” theme with introducing more models in the K Constantinoples line of vintage sounding cymbals. 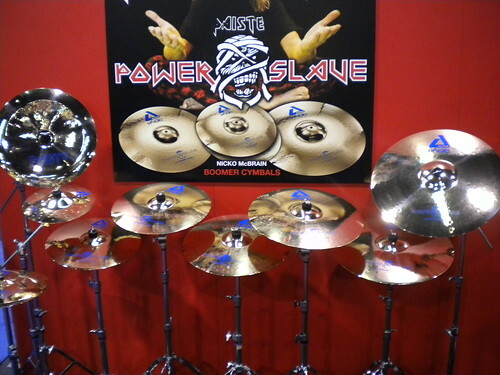 Sabian did show their new fan chosen models, but the booth mostly showcased their wide range of models from their 30 year history. I also stopped at the Silken booth, and was impressed with what they had for their price range. This device caught my eye: An electronic drum tuner call the Tune-Bot. And unlike tensions watches, drum dials, torque wrenches and other items that measure criteria that should lead to a drum in tune, yet do not always work accurately, this measures the pitch of each individual lug, letting you know if the drum either in tune, or not. And while other tuning devices work on toms, I find most of them are useless on snare drums and bass drums, while this one works on snare drums easily enough, and should translate to a bass drum well. Also, unlike drum dials and such that you have to move from lug to lug, this device you clip on to the drum in one spot. And unlike a regular chromatic tuner, this allows you to just to tune to any pitch regardless of a specific note, as you can set it to give you a reading in Hz or musical notes. I also thought, as a drummer who tunes by ear, how many times have I found myself trying to tune at a venue when another band is sound checking, or the DJ is testing out the PA, or a guitar player is testing his amp, or otherwise it’s just too noisy to hear the difference from lug to lug? 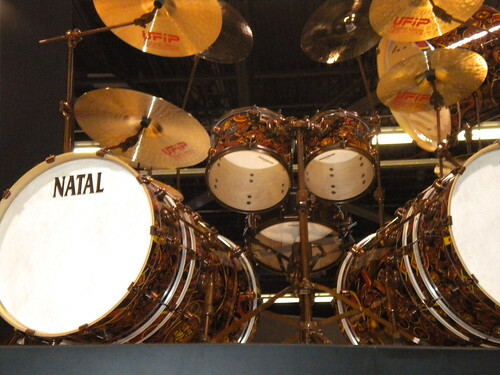 Yet, in the middle of Hall D at NAMM on a Satuday afternoon when it is insanely noisy, yet this device was (as far as I could tell) still able to get a measurement from the drum without being bothered by the extraneous noise. The biggest drawback is the price, at $150 retail, $99 projected street price. Although you figure a drum dial is $59, and this should work 100 times better, and Boss TU-12EX Chromatic Tuner is close to $99, maybe that price is not so far out. Most Innovative new Product: Tune-Bot drum tuner. Thank you. I know I walked by the Dunnett booth, but I did not get a close look. My understanding is it will available at Guitar Center in a few weeks. Some genuinely nice and useful information on this web site , likewise I believe the design and style has superb features. Fantastic publish, very informative. I’m wondering why the opposite experts of this sector do not understand this. You must proceed your writing. I am sure, you’ve a great readers’ base already!|What’s Happening i’m new to this, I stumbled upon this I have found It absolutely helpful and it has helped me out loads. I hope to give a contribution & help other customers like its aided me. Great job. Hey There. I found your blog using msn. This is a really well written article. I’ll be sure to bookmark it and come back to read more of My 2012 NAMM Report | Problems and Results with Ian W Mayer . Thanks for the post. I’ll certainly return. I am usually to running a blog and i really admire your content. The article has actually peaks my interest. I’m going to bookmark your site and preserve checking for new information. I simply want to say I am all new to blogging and definitely liked your web blog. Very likely I’m want to bookmark your site . You certainly have excellent articles and reviews. Cheers for revealing your webpage. Hey!! Many thanks… I’m a legally blind drummer and don’t get around as much as I used to and really appreciate the information! Thank you. Great article! I loved the knowledge and the information given . Additionally, your writing style is very fun to read. If you have time kindly make sure you visit my brand new webpage and tell me what you think. Iâ€™m having a little problem I cant subscribe your feed, Iâ€™m employing google reader fyi. I like the efforts you’ve got put in this, thanks for all of the excellent blog posts. Totally indited content material , Really enjoyed searching at . that I’m not sure if they are sturdy egonuh to be used as performance drums. There do have some weaknesses. They are sturdy egonuh for sane use, but if someone plans on abusing them I don’t think they would take too much punishment. Overall though, I am very pleasantly surprised with the quality of the hardware and the drums themselves. They are much better than I had expected for the price. I tuned them to their shells. In other words, I took the empty shells, hung them free, and used the kick drum beater to rap on them and recorded the tones they made. Then I placed the drum heads on and tuned those to the same pitch. This was a procedure that I learned from a drum manufacturer. This method of tuning worked very well with these drums and I am very well pleased with their sound, timber and pitch. For someone just starting out on the drums, these drums are great!By the way, they sound great, and they aren’t that flimsy. So they can be used as performance drums. They just aren’t going to stand up to neglect and abuse. If they are treated as a musical instrument they should be just fine.